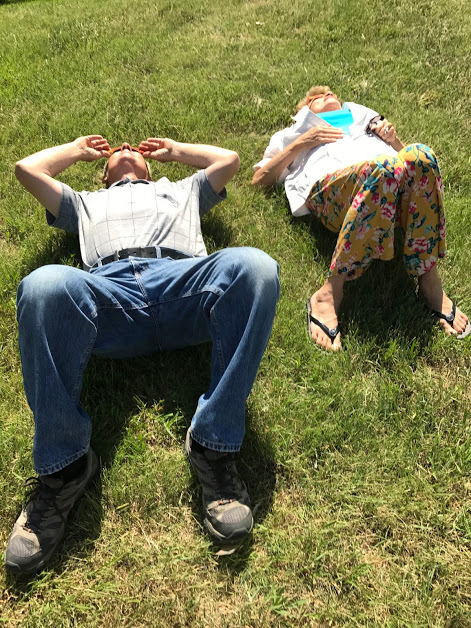 For the past few months, as people have been talking more and more about the total eclipse which much of our nation watched yesterday, I have ignored the excitement. Eclipse-schmeeclipse, I thought to myself. Because if I haven’t grasped anything else about getting old, I EXCEL at being crabby. When friends of ours told us they were driving to Podunk, Nebraska, (not a real town, so stop googling it) and paying as much for a motel room as one would pay to stay at the Waldorf Astoria in New York City at Christmastime, I nodded and said wow, that’s awesome, but thought to myself wow, that’s stupid. The media started getting more and more excited as the event neared. 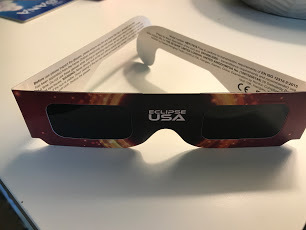 For the past three weeks, our local NBC station has been hawking their own branded eclipse glasses. Go to your nearest Grease Monkey and get your glasses, they would shout. Otherwise you will miss out; otherwise be stupid and look in the sky without these glasses and go blind. 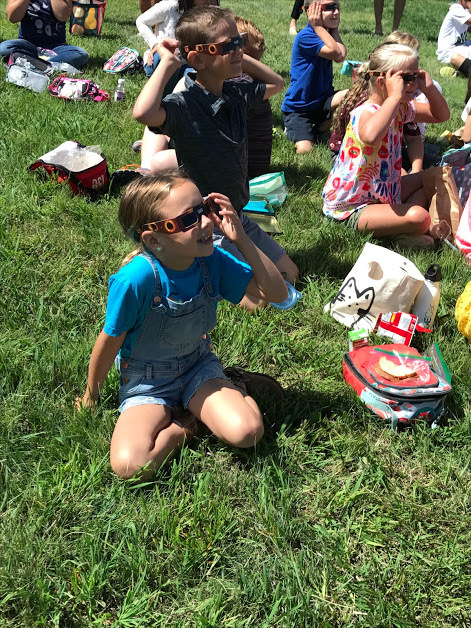 Until about three or four days ago, when it occurred to me that I might not see another total eclipse of the sun because who knows how crabby I’ll be by 2024 when the next total eclipse will occur. I may even be too crabby to go outside. All of the Grease Monkey glasses had been swooped up by then, of course. As the hours, then days, ticked by, the likelihood of obtaining the necessary blindness-preventing glasses diminished, until the possibility was as little as that pinprick-in- the-cardboard option they were offering us losers. One night, my telephone dinked, indicating a notification from our neighborhood internet group. I immediately – IMMEDIATELY – looked at the notification and saw it was from one of our neighbors saying he had four spare pairs of glasses. I immediately – IMMEDIATELY – clicked on his email link to request the glasses. He responded, telling me the glasses had been claimed practically before he hit the send button. On Sunday night, our local NBC station was nearly in histrionics over the event. Remember the old game when we were in college where you would watch an episode of The Bob Newhart Show, and drink a shot everytime someone said Bob? Well, I was wishing I had a bottle of Fireball whiskey and a shot glass and could drink a shot every time one of them used the phrase zone of totality. It didn’t matter whether it was the local news, the weather news, or the sports news. Everything was linked to the zone of totality. Of which we were in the 92 percentile. Dang. I wasn’t going to be able to see the historic event. I was going to have to resort to looking through that damned pinprick. So I sadly mentioned that fact to Maggie Faith Sunday when I dropped by to deliver my guac and chips. Come to our school with Mom, she said. They have tons of those glasses. Which is what I ended up doing because 9-year-olds are way smarter than 63-year-olds. Jll and her mom Lynne and Bill and I checked in at the front office of Magnolia’s elementary school around 11:30. Do you happen to have any spare glasses, we asked tentatively. And Maggie was right; they had tons of them. 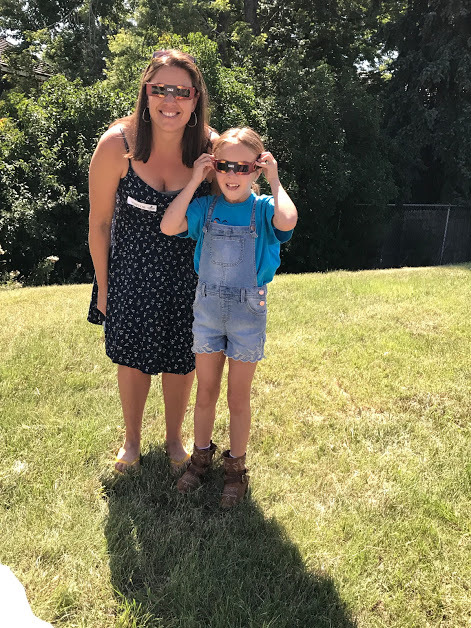 Enough that we each got a pair, and there were very many to spare…..
Maggie, along with all of her fifth grade pals, watched the solar eclipse. 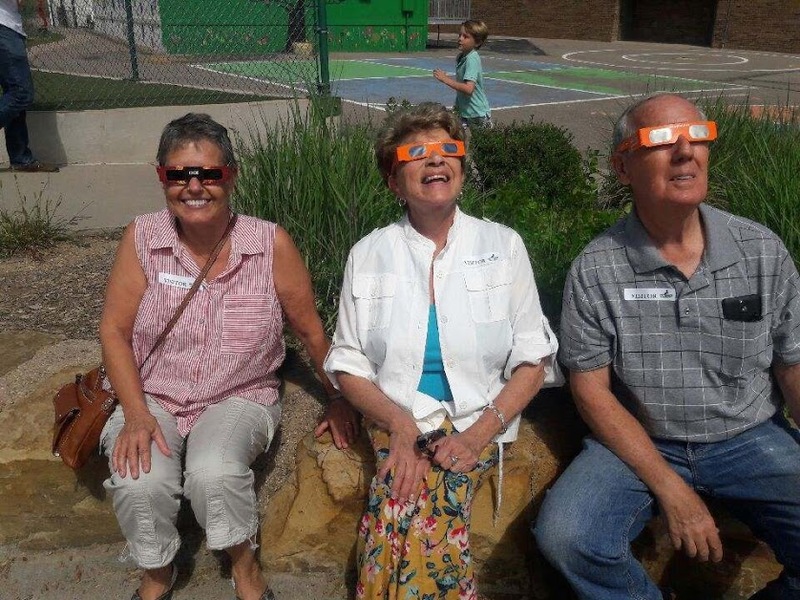 Bill, Lynne, and I watched as the moon passed in front of the sun…..
As did Jll and Maggie Faith….. But my favorite photo of all: I’ve fallen and I can’t get up…..
As it turns out, I couldn’t be happier to have witnessed this scientific phenomenon. It was fascinating. The air actually cooled down as the moon passed the sun, blocking its heat for a brief time. 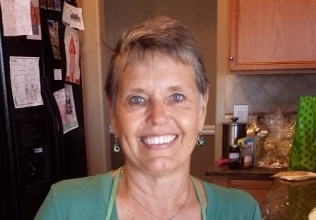 The temperature dropped from 85 to 77. Mostly I was happy to watch the kids of Maggie’s school seeing the amazing work of God. 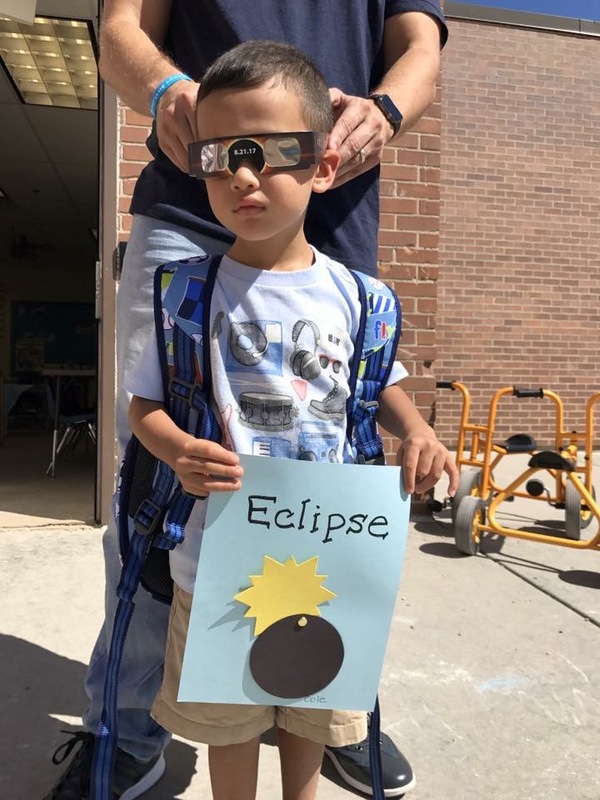 Cole got to witness the hand of God as well at his school, though he looks like he’s not sure what to think…..
And, I leave you with this, Baby Boomers. Don’t Bill and Lynne and I look like we are straight out of the 1950s at one of those early 3D movies? You heard it from me first because I heard it on the news. Don’t drive a car with those glasses on. Okey dokey! Bill wondered aloud this morning, when will we see the first class-action lawsuits? Glad Maggie Faith clued you in and included you in her school event. :) It was pretty awesome and I just got to experience it on tv. It really was one of the cooler things I’ve ever seen. Glad my grands got to see it.